"My background in photography was old school. Getting my hands dirty, processing film in the darkroom with lots of toxic chemicals. It was the magic of seeing my images gradually appear on the prints which was always such a thrill. I still get that thrill today in front of the screen with photoshop open. When digital arrived in photography in the early 2000s, I embraced it, learning everything I could about the wonders of Photoshop. Alongside the digital processing, I crafted a lighting style which was inexpensive, out of necessity, yet very effective. My style is upbeat, backlit, romantic, positive, beautiful. If my lighting style were a movie, I’d say it was 'Mamma Mia'. All backlit hair and with the kind of images that make you want to fall in love and break out in song! I've been earning my living from photography for ten years and my first dedicated studio was opened two years ago and now, the time has come to create a more boutique, upmarket, luxury brand. The new studio is like a luxurious Penthouse. As Richard Gere said in Pretty Woman, I want the Penthouse because, "it’s the best". Working alongside me on every shoot is Shareen Kellett. I met Shareen when she bounded into the studio wanting a photoshoot. Try as I may, I couldn't get her to leave. "I came in for a photoshoot after stalking the company for months. I loved the pictures and always admired all the other girls on the website. I knew it would be a tremendous confidence boost and I really wanted some pictures that would last for the rest of my life. The experience was amazing on the day of the shoot. I used to work for a couple of photographers a few years ago and knew how studios work but Dave was so professional and everything was so relaxed and easy going. The pictures at the viewing were just jaw dropping, I nearly cried! It seems I was in the right place at the right time. I offered up my services since I'm a qualified hairdresser and make-up artist and I've been here ever since. Dave is amazing to work with and we've now created a really strong team. I've always thrown myself 100% into everything I do and look forward to helping Madison Bou become the number 1 make-over studio north of London. I love my clients and always do everything I can to go the extra mile for them. This is the most exciting job on earth. 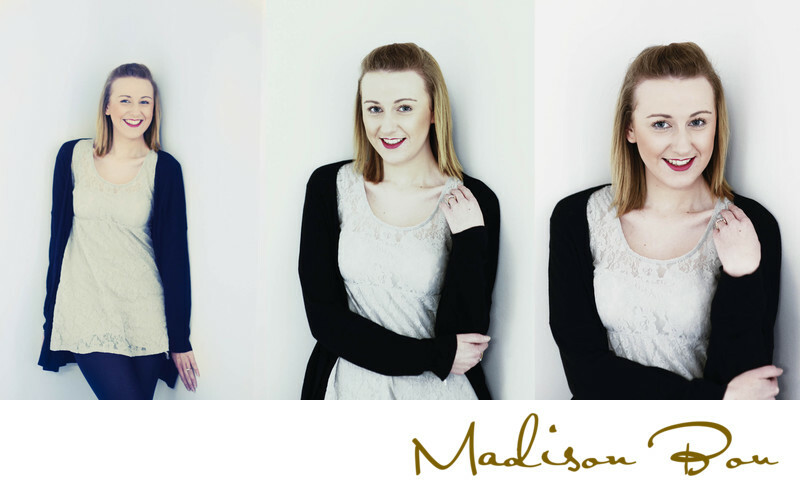 "I worked with Dave over the last couple of years while finishing my degree in make-up and it was wonderful to be invited to join the new team at Madison Bou. I’ve worked at some other make-over studios and love that here, we don’t rush. Everything is about giving the client a special, relaxing experience. It’s always fun as well. We can’t stop laughing. I’m allowed the time to create something individual for each client. It’s what I got into make-up for." The newest addition to our team. Why the name Madison Bou? We ran a Facebook competition to find a name for the studio which summed up our well heeled, discerning female clientele. We had hundreds of suggestions and in the end we gave away a dozen prizes to some of those with the best suggestions but somehow nothing really struck a chord with us. It was Jane, in the final stages, who came up with Madison, the name of a horse she grew up with in her youth and Boo, what she says when she can’t think of a word. “What was that we were watching the other day?…oh Boo!” We then upgraded the expression to add a little… class. So Madison Bou it is. Madison Bou for Boudoir, Babies and Brides. - Every picture we take is with the same care and attention to detail. Every image is carefully worked on to perfection. We go the extra mile because it’s what our clients expect. Ready to book a shoot or want to find out more?